Well, it’s 1st January 2011, and that can only mean two things! 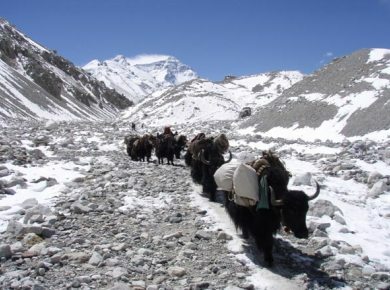 Firstly, for those of you still striving for an all-correct Listener year, here we are in the foothills, with the long trek to the summit lying ahead of us. It doesn’t look too bad ahead, does it? A bit rocky perhaps, but we’ve come to expect that! Secondly, after having been short-changed last year with only 51 puzzles, this year it’s 53. OK, so that means it’s a slightly longer trek to the summit, but we like a challenge … don’t we?! So the first puzzle of the year is by Loda, one of the more prolific setters, especially in the Inquistor and EV series. 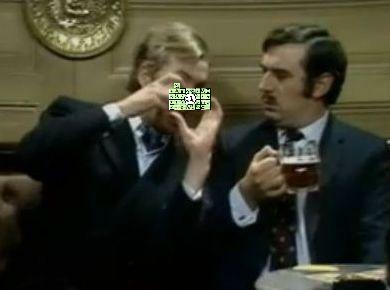 But who can forget his Listener from a couple of years back, In Clue Order, On and On with its umpteen hidden messages resulting in the infinity sign being drawn on the grid? Here we have what looks like a German puzzle, Auf Wiedersehen, and a grid with what looks like a hole in it. Oh no, not more cutting out so early in the year. The preamble starts quite encouragingly … “In one cell, two answers clash”. Just one cell … a bit bizarre, but at least there’s only one of those damned clashes! 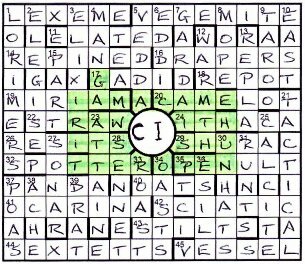 Every clue contains an extra word from which the first and third letters spell out thematic material. The first pass through all the clues gives me 14 REPINED, 19 MIRIAM (not Tom! ), 32 SPOTTER, 40 OATS, 41 OCARINA and 42 SCIATIC for the acrosses. A rather lean 2 ELEGISE, 3 ELIXIR and 39 DRAT for the downs. 26ac is the next clue to be solved and provides the first of six with two definitions to words differing by a single letter. On initial reading, I assumed this meant these clues would lead to two words like CAT and COT, but in fact it turns out the words are like CAT and COAT, one having an extra letter over the other; 26ac is RESIT[E]S. These extra letters are destined to spell out something else thematic. 1dn LORIMERS and 1ac LEXEME are next, followed closely by 4dn MANIA and 17ac CADI and voilà we have the clashing letter. The new down word must be MANGA or MANNA or MANTA, but only MANGA gives a real across word, GADI, an Indian throne (which I haven’t heard of before). Thus we have C and I to be entered in the central circle but in an order still to be determined. I think the grid was finished reasonably quickly (for me), probably just over of two hours. There were some interesting points for me on the way: like GADI, I’d not heard of 1 LEXEME or 37 PANDA[R] before, and it took me a few minutes to realise that 12dn being ..RMT. actually was a word, and a simple one at that: WARMTH. It reminded me of the pub quiz question: “What’s the only English word ending MT?” (Actually there are three, but all variations on the same root word.) Finally, I had to satisfy myself about 30dn UNHATS (Removes tarpaulin, eg, one’s holding around [grain] — tons, grain being the extra word). I kept trying to put UNS (one’s) around HA and T (tons), before realising that one’s holding = one is holding = one has. I’d managed to get the two tableaux and five names from the extra words well before actually completing the grid. They were MAN SHAVING AT THE WINDOW and WOMAN IN KIMONO WASHING HER HAIR, followed by SALLY BOWLES, FRAU NOWAK, FAULEIN SCHROEDER, NATALIA and OTTO. I’m afraid these meant absolutely nothing to me, and mistakenly thought they might be ‘characters’ in paintings by an artist whose initials were IC, maybe Canaletto (no, he’s GC), Cezanne (PC) or Carravaggio (he’s actually MM de C). The extra letters in the two-definition clues spelt out BERLIN, so a German artist perhaps. Well Wiki failed to enlighten, so I tried the Oxford Dictionary of Quotations, always a trusty friend of the Listener, but this time it provided nothing. In the end, I had to resort to Google, which came to the rescue with Christopher Isherwood and Goodbye to Berlin. So it was CI in the central cell. Little did I realise that the 28 contiguous cells that needed highlighting would be staring me in the face, not in some devious diagonal or circular shape, but in a straightforward 7×4 block around the central lens of the grid: I AM A CAMERA WITH ITS SHUTTER OPEN. So why did it take me over ten minutes to find it?! I think I was expecting slightly harder clues from Loda … his Inquisitors are generally pretty tough, I think. I must say that I thought some of the surface readings a bit odd (eg Quickly say to them inside, “[Alastrim] — it’s spread all over Oz”), but I liked the reference to Georgette Heyer and the priests getting high on Ribena! A good solid start to the year, and a nice implementation of the theme from Loda. Not for the first time, a Monty Python sketch popped into my head. Here, it was the one where Eric Idle plays the man in the pub who is constantly annoying Terry Jones with his double entendres and constant utterance of “Know what I mean” and “Nudge, nudge” (see Chambers under nudge)! Here he is asking Jones if his wife is interested in photography … “Nudge, nudge, snap, snap, grin, grin, wink, wink, say no more”. This entry was posted on 21 January 2011 at 5:00 pm	and is filed under Solving Blogs. You can follow any responses to this entry through the RSS 2.0 feed. You can leave a response, or trackback from your own site.